In a performance that had many praising its avant-garde catchphrase stylings, President Trump welcomed the national champion Alabama Crimson Tide football team to the White House last month and proceeded to speak for approximately three hours about, I assume, how he’s actually glad he didn’t win the popular vote in the 2016 election. As is completely normal when the leader of the free world and his administration host such a mundane event, the fallout and drama from the president’s meeting with the college athletes has yet to be fully resolved within the White House. 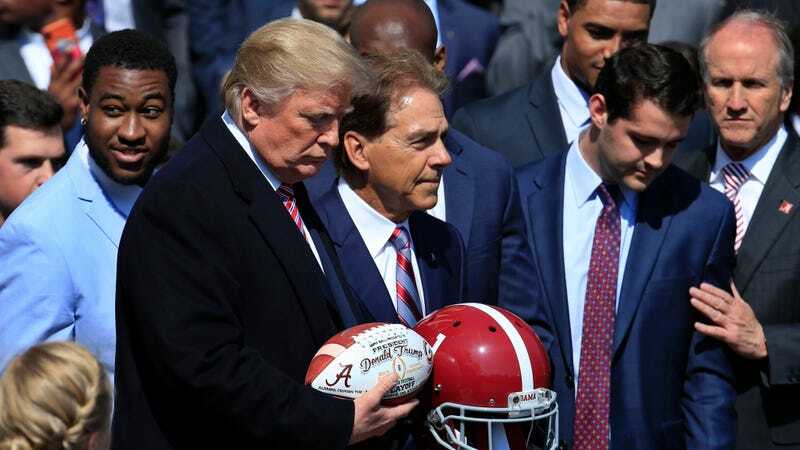 Sims told colleagues he had received sign-off from the White House counsel’s office to have the ball signed and gifted to the Alabama state house, and never handled the ball again after dropping it off. Other staffers said they saw it in Sims’ office after the team left the White House campus. Either way, the ball eventually ended up on John Kelly’s desk, and the frustrated chief of staff summoned Sims into his office to ask him what the heck was going on with his unexpected presence in the Oval Office, and a signed football floating around the White House. Sims declined to comment. Hopefully the football is located soon, so Trump staffers are able to move on to their next poorly executed, half-baked idea that nobody in the White House will comment on or take responsibility for.